The Giant Panda Genome Project was launched in May 2008 with the goal of generating high-quality panda genome sequence through next-generation sequencing and assembly methods. The giant panda is a world-famous cherished animal and is also considered a symbol of China. However, at present, only about 1600 to 3,000 panda survive in parts of China, and they are on the verge of extinction. On the long evolutionary path, giant pandas have gradually developed some unique adaptability, especially their feeding on bamboo, and other behavioral patterns. There is evidence that the ancestors of giant pandas have appeared in China 8 million years ago, so people call it "living fossils." Taxonomy and genetic studies suggest that giant pandas are closer to bears than to raccoons that were previously considered to be common. There are still very few studies on giant panda at the genome-wide scale. Its genome size is about 3Gb, similar to the size of the human genome, and it is estimated to encode 20,000 to 30,000 genes. The Giant Panda Genome Project was launched in May 2008 with the goal of generating high-quality panda genome sequence through next-generation sequencing and assembly methods. The sampled pandas are male and female and live in the Chengdu Wolong Giant Panda Conservation Center. 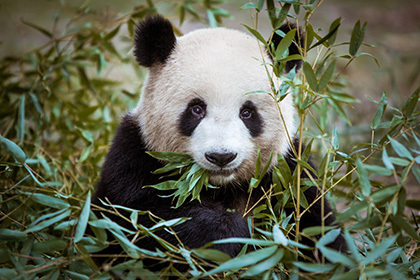 The genome-wide sequence provides unprecedented information on the panda&apos;s genetics, which greatly advances the genetic and biological research of the species for disease control and conservation in endangered species. Technically, the implementation and completion of the program will also have a profound impact on the de novo assembly and splicing of large-scale mammalian genomes and the development of various bioinformatics tools for next-generation sequencing technologies. Li R, Fan W, Tian G, Zhu H, et al.The sequence and de novo assembly of the giant panda genome.Nature. 2009 Dec 13.